Is there anything better than being on a rooftop? Presumably taking a dip in a gorgeous infinity pool on top of a luxury hotel, right in the heart of a chaotic metropolis, like Hong Kong. 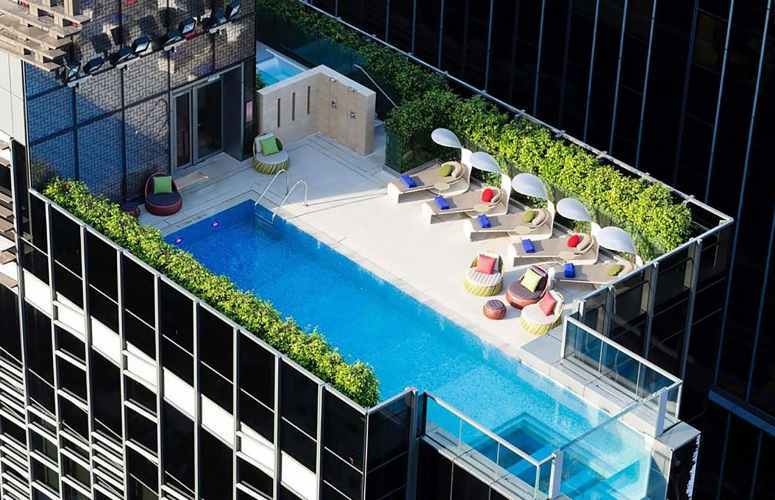 Rooftop swimming pools are the latest urban trend. We rounded up some of the most spectacular sky-high pools in Hong Kong: they are part of hotels, but some of them accept external guests too. 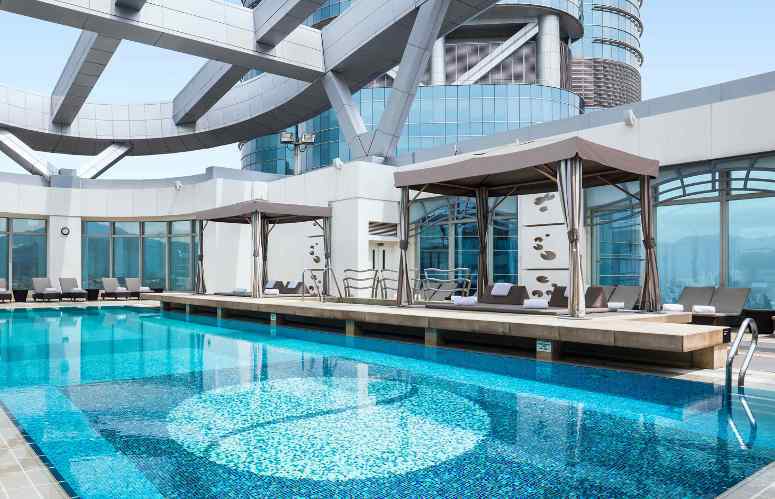 Located in Central district and overlooking Victoria Harbour, this magnificent hotel offers one of the best rooftop pool complexes in Hong Kong and an incredible view. Its amazing infinity-edge pool is not very high, but it seems to stretch to the waterfront, as though there were no borders between the pool and the sea. That’s an incredible perception you can enjoy even more listening to underwater music. The pool is for hotel guests only. There are also a 20 m lap pool, a whirlpool and a freezing plunge pool. This luxury hotel also provides fairy-tale rooms, bars, Michelin-starred restaurants and a full service relaxing spa. The Pool Terrace is for hotel guests only. Located on the 11th floor, the 50 m heated outdoor swimming pool offers and incredible view of the harbour and the cityscape. It is surrounded by a tropical scenario garden, a 400m jogging path, a waterfall. You can relax swimming, or sunbathing on the deck chairs around the pool, sipping a drink. Pool parties are organized on Sundays. There are several bars and restaurants for all tastes in the hotel. External guests can buy daily passes to enjoy the pool, the indoor fitness area and the sauna. The hotel is connected to Pacific Place shopping complex and overlooks Victoria Harbour and Peak. Everything is amazing at Conrad’s Hotel, from the view to the facilities and the food. Enjoy the outdoor heated swimming pool and experience the lights of the city from the pool by night (it is open to 10 pm every day). Relax with the sauna, the Jacuzzi and massage service, keep fit in the fitness center, and taste Cantonese food, Italian cuisine or International buffet at the hotel’s restaurant. Outside public is welcome both on weekdays and weekends. 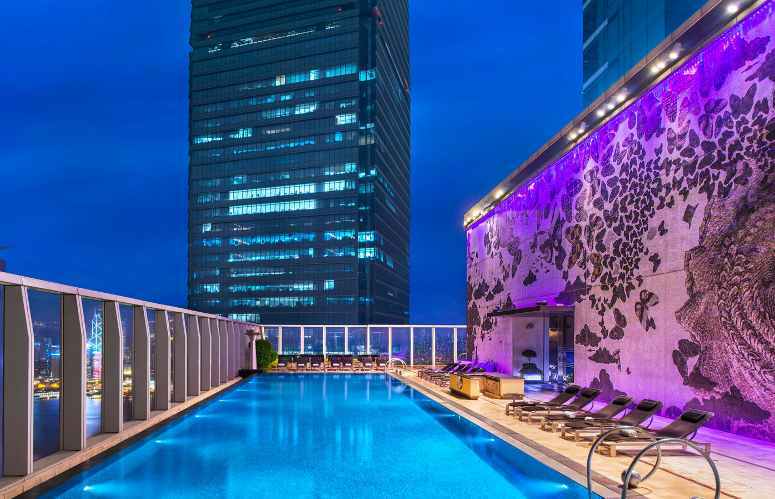 This stylish and trendy boutique hotel is located in the vibrant Wan Chai district and provides one of the most amazing rooftop swimming pools in Hong Kong. Placed on the 29th floor, one of its sides has a glass bottom and hangs off the hotel. This gives you the feeling to swim in the emptiness surrounded by the buildings. The pool is open until 10 pm and swimming at dark in the illuminated bottom-glass pool is even more breathtaking. The pool is open to hotel guests only. The hotel occupies floors 102 to 118 of the International Commerce Center skyscraper, 490 m high. This luxury hotel, worthy of its name, offers a stunning open view on Koloon, Hong Kong Island and Victoria Harbour. 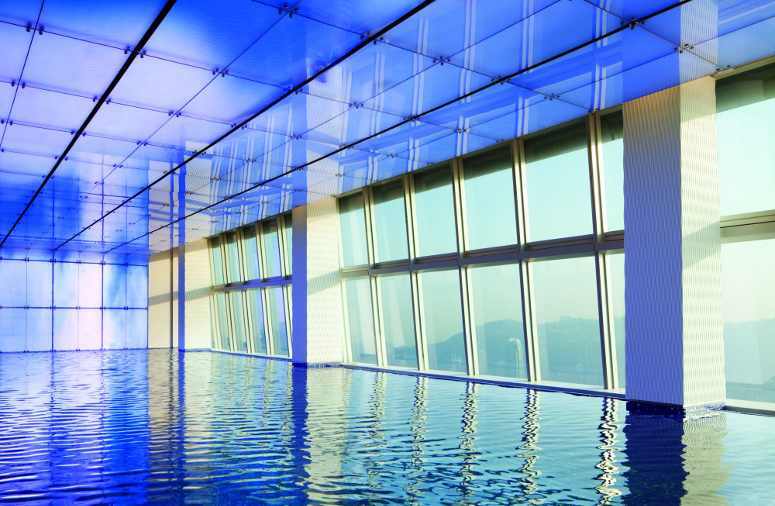 Located on the 118th floor, its famous indoor infinity pool is the highest in the world. You can enjoy the scenario from the pool watching through the floor-to-ceiling glass windows while swimming. On the same floor there are an outdoor Jacuzzi and a bar. 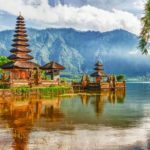 The hotel also provides 6 restaurants (2 of them are Michelin award-winning), a business center, a fitness club and, of course, full spa service. Accessible to public with a Day pass. 1 Austin Road West, Kowloon Station. It is located in a strategic position nearby the Kowloon MTR Subway Station. 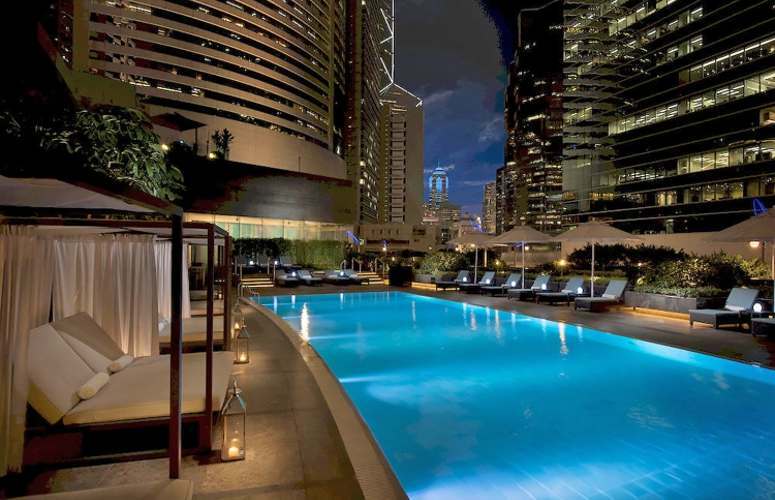 This hotel featuring glamorous luxury interiors, offers one of the most stunning rooftop pools. Located on the 76th floor, in fact, it is the highest outdoor pool in the world: the rendezvous point with the sky. The incredible view on Hong Kong skyline will leave you speechless. On the same floor you can find the Jacuzzi, the gym and the bar, where to enjoy a drink in an amazing context. The pool is open to outside guests only in the weekends during the summer. This well-known hotel is a dreamy place where to enjoy one of the most panoramic views of the cityscape, while swimming in one of the largest infinity pools in Hong Kong. Enjoy the show of the pool’s edge almost stretching to the sea, or relax in one of the infinity Spa Pools. 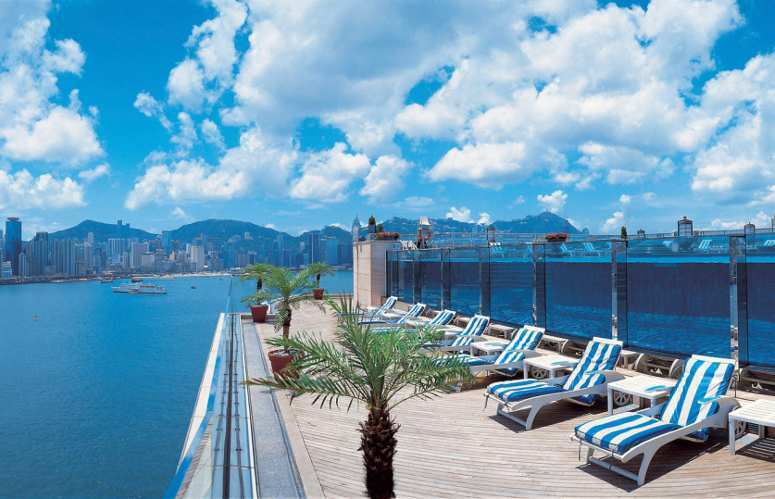 Watch the sunset from the swimming pool, or dine on the wooden terrace overlooking Victoria Harbour! External guests can enter the swimming pool only purchasing a full day spa program. Opened in 2011, this hotel is a perfect example of modernity and trendy interior design. This 5 star hotel is much appreciated for its wonderful location, contemporary style and modern facilities, but also for its reasonable prices. 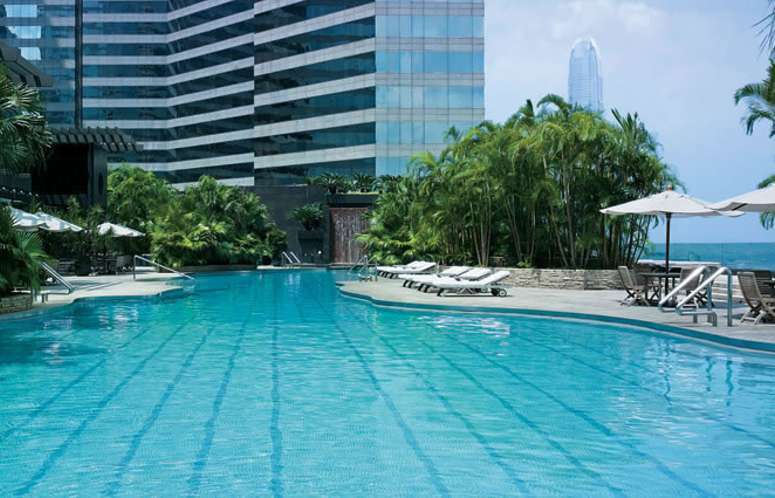 The inspiring heated swimming pool is located on the 9th floor and offers an open view on Victoria Harbour. You’ll feel like swimming among the buildings. Experience the sunset and the sunrise from the mild water. The pool, in fact, is open from 6:30 am to 21:30 pm. This renovated elegant hotel offers a 20 m heated rooftop outdoor pool. Located on the 40th floor and surrounded by an amazing scenario up to the mountains, you can also swim late in evening within a game of natural and underwater lights. Open, in fact, to 6:30 am to 11:30 pm you can live a sunset-to-sunrise swim experience. Enjoy your swim listening to soft underwater music, take your moment relaxing on the deck chairs or drown your stress in the nearby Jacuzzi. The hotel also provides a fitness center. Don’t miss the 2 star Michelin-rated Cantonese restaurant or one of the other restaurants in the hotel. Outside guests can access to the pool buying a Day pass. Its luxury interiors and stylish bottom-to-ceiling glasses, together with its stunning rooftop pool, fulfill the expectations of the hotel’s name. 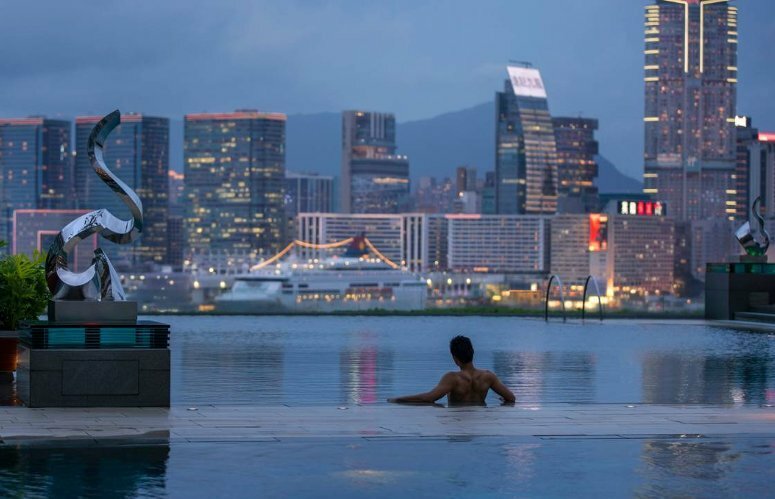 Its amazing outdoor infinity pool on the top floor offers an incredible view of the Harbour and the cityscape. You can also enjoy the scenario relaxing on a chaise-longue overlooking the city. The pool seems to form a continuous line with the Kowloon waterfront: the effect is breathtaking! The fitness center and the spa service make your stay even more comfortable. Enjoy your dinner in one of the 6 fabulous restaurants of the hotel. The pool is accessible to members and hotel guests only. To find a swimming pool and a spa in your hotel is fundamental, when you need to relax after hard work or to enjoy your holiday at best. And to swim close to the sky, watching the sea and the horizon, is even better. 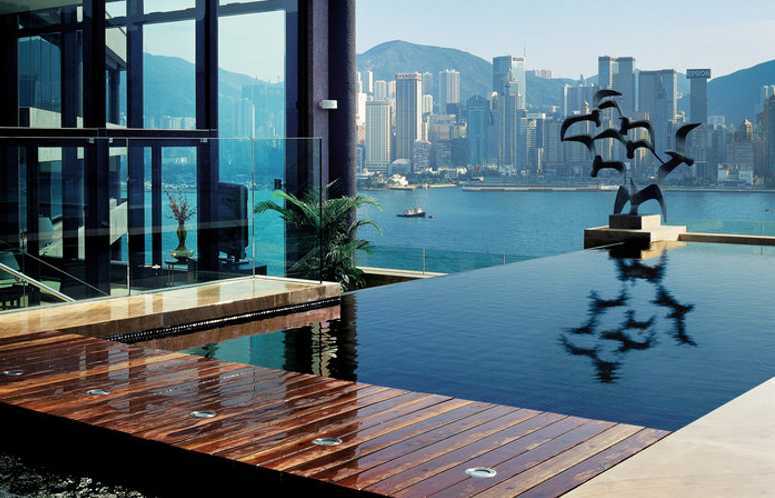 That’s what many hotels in Hong Kong offer, providing some of the most amazing rooftop infinity pools in the world.